Tom Noonan, a former student of Unit 12 (tutored by Jonathan Hill, Elizabeth Dow and Matthew Butcher) has won first place in the RIBA Journal Eye Line drawing competition. 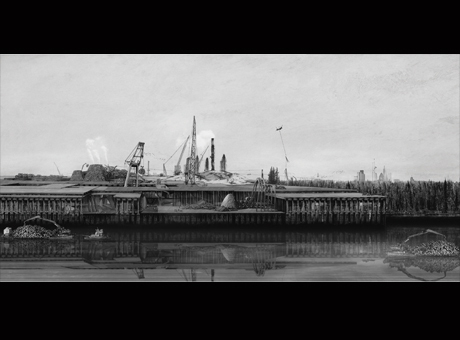 The judges unanimously voted him the winner out of more than 250 submissions for his Bartlett Diploma project, Reforestation of the Thames Estuary. The project imagines the transformation of a city and its environment, in a future where timber is to become the city’s main building and energy resource. Niall McLaughlin Architects (Unit 17 Tutor), Luke Pearson (Unit 4 Tutor), and Janinder Bhatti (former Unit 11 student) were all commended. One of Tom's drawings is featured on the cover of the August 2013 issue of RIBA Journal.